On November 21-22, 2014 and for the first time, an film festival was held with exclusively horse-related content. The Equus Film Festival NYC had 119 entries running in three theaters over the two-day exhibition, ranging from documentaries and feature-length films to music videos and commercials. Countries such as the USA, Spain, the UK, Canada, Australia, Iceland, Sweden and Japan were among those represented. No doubt, it was all about horses! Collaborators Lisa Diersen of Equus Concepts and Sarah Chase of Horse Lifestyle TV teamed up to create a world-class event uptown in The Big Apple, at the MIST Theater in Harlem. 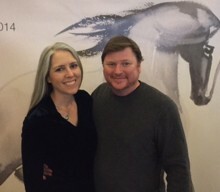 I attended the festival as my music video Believe, Believe, Believe was an official selection, and I could not pass up the opportunity to meet such a varied group of creative people working to tell the stories of horses, and the feelings that they inspire. The range of submissions was eclectic, and I followed the schedule to bounce between the theatres and the lobby, for coffee breaks and fascinating conversations. I was honored to meet Rupert Isaacson, author of The Horse Boy, to see the focused passion he has for honest horsemanship. I spoke with Veterinarian Dr. Lester Friedlander, who shared his immense efforts in stopping inhumane horse slaughter. And I witnessed the beautiful freehand drawings of Beatrice Bulteau, the artist who created the film festival logo. There were so many things to see, and I could not get to them all, but here is a selection of offerings that resonated with me. The Path of the Horse by Stormy May: Sharing the philosophies of Carolyn Resnick, Klaus Ferdinand Hempfling, Linda Kohanov and Alexander Nevzorov to remind us to stay youthful in spirit, learn to dance with life, and be comfortable with not knowing what we are doing. Such is the Real Nature of Horses by Robert Vavra, France: A scientific approach to studying the wild horses of the Camargue, to discern their natural behaviors for increased insight into domesticated horses. Dakota 38 by Smooth Feather Productions: A deeply moving story of how a Native American Viet Nam Veteran manifests a fire dream into a horse journey across the Great Plains to heal not only himself, but his culture and the lives of those he meets on the ride. Getting Started in Lightness by Lisa Maxwell: Creative exercises to develop your seat for better balance and confidence in the saddle. The Wishing Horse by Alex Darby, Ireland: Fictional account of how a family deals with their father’s death, and the powerful symbolism of a large white horse pictogram carved into a Irish hillside. Mil’s Life by Zach Hauptman: Follows the path of an inner-city Philadelphia youth, and how horses have kept him on a positive path. Stunning images of him riding through the streets of Philly, and longing his horse in an overgrown lot. Running Wild: The Life of Dayton O. Hyde by Suzanne Mitchell: A look at the life of a dedicated horseman and creator of a horse sanctuary in South Dakota. Lovely and atmospheric soundtrack, and winner of Best Music Video. D’Artagnan is the Champion by Melissa Palmer, Jennifer Bates & Drew Sawyer: A humorous journey to research the heritage of a dressage horse, which winds its way to unexpected parts of Georgia and a cast of unique characters. Winner of the People’s Choice Award. On a individual note, seeing my music video for the first time on a theatre screen, in surround sound, was almost overwhelming. I am reminded of Yoga Teacher Seane Corn’s Off the Mat, Into the World program, which promotes turning your own personal transformation into social change. It is remarkable to me that my simple idea grew into a project that I could share with the world, but this is at the crux of my experience, and the journey of so many fellow creators I met at the festival. Horses have a way of bringing out the truth and the best efforts in people, and may we all move forward in collaboration and deeper understanding. 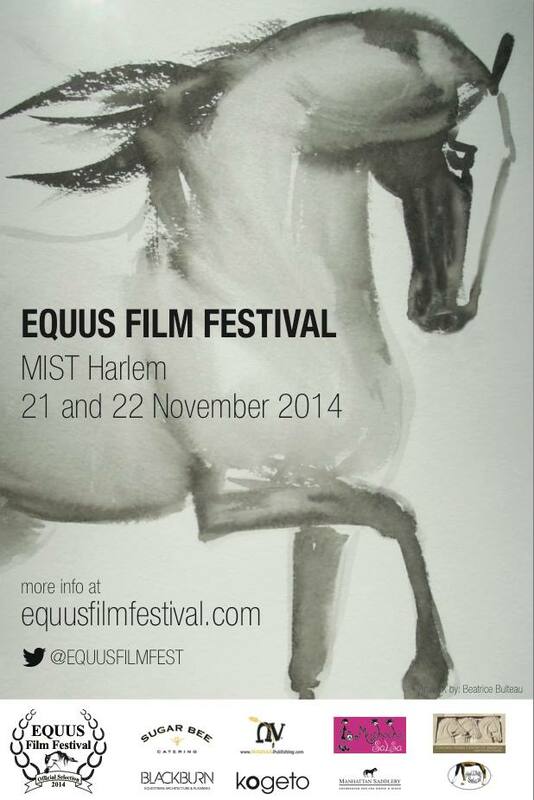 All indications are that there will be a second Equus Film Festival NYC next year. You can find out more at www.equusfilmfestival.com. In the meantime, consider the annual Festival of the Horse and Drum, being held near Chicago August 15-16, 2015. See www.festivalofthehorseanddrum.com for more info.